While reading the Commonwealth Fund’s 2010 annual report essay by John E. Craig, Jr., executive vice president-chief operating officer, someone whose writings I enjoy because he seems to appreciate the fact that financial officers can contribute considerable knowledge to the workings and values of foundations in America, I came across a startling fact. According to Craig, in 2008, U.S. foundations spent the equivalent of $675 million in costs associated with preparing and filing their form 990-PF tax returns. Money aside, what really got my interest is Craig’s assessment — that I imagine few would quibble with — that the 990-PF does little in his words to promote “accountability and best practices in the foundation sector.” Thankfully, he has some very interesting suggestions to make the 990-PF a more valuable document, including as a communications tool for foundations. –Craig believes foundations need to break out expenses to show a more useful picture to readers of how much is spent annually on grants and direct charitable activities, and which expenses are for grants administration, endowment management costs, unrelated business costs, and general administration. –He also says “the return should be used to prod foundations to use Web sites to report information on their programs and performance that cannot be readily conveyed on a tax return.” For example, he suggests a question be added to the 990-PF that asks whether the foundation maintains a Web site, and if so, to request its url. Surely in the Internet age, maintenance of a Web site that discloses basic information on the foundation’s activities, governance, and management should be a fundamental test of accountability. –Craig also thinks a more thoughtfully designed 990-PF, and one that they would have the option of filing electronically, would allow foundations to meet the reporting requirements about their missions, goals, strategies, and results by linking “the informational requests of this section of the return” to their Web sites. –Another of Craig’s recommendation would both make it possible for foundations to e-file, and, at the same time go beyond the minimal reporting requirements. That could be done, he says, by permitting those foundations already doing so (and hopefully more will follow) to link to the grant information they are posting online nearly in real time via the Grantsfire and eGrant Reporter systems. 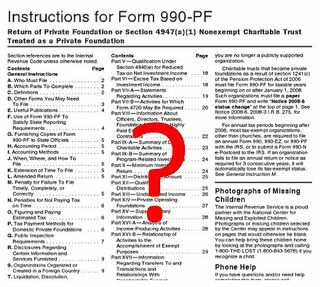 By taking this step, the 990-PF would no longer serve as a print repository for lists of grants made by individual foundations. Instead, raw data on grants by individual foundations would be available on their Web sites, while cleaned and structured data would be available through the Foundation Center’s electronic databases. Foundation transparency would be enhanced, while the currency of data provided to the Foundation Center would be greatly improved. —The basic return should be as short and uncomplicated as possible and written in plain English.